Location: St.Bartholomeus Gasthuis, Utrecht, Netherlands. 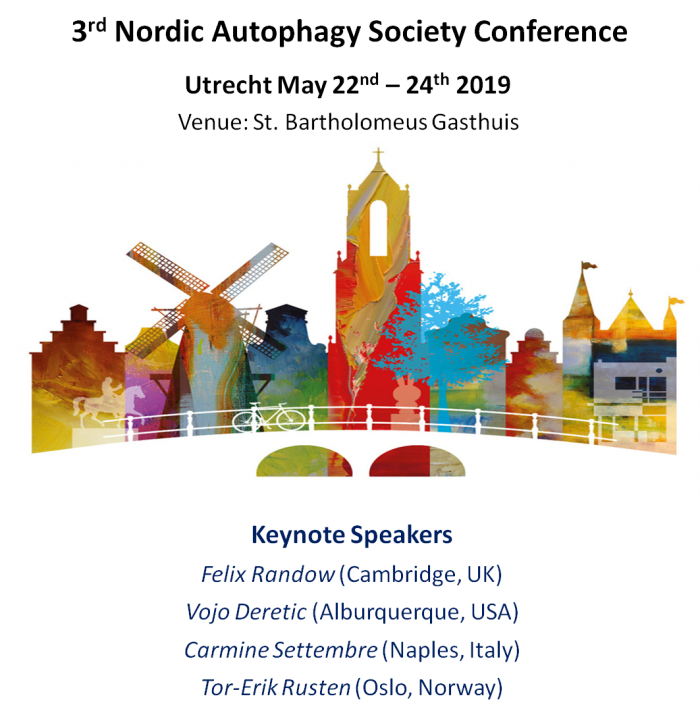 This 3-days meeting will include 16 selected talks from abstracts (15+5 min each) and 2 poster sessions presenting cutting-edge autophagy research in the Netherlands, the Nordic and Baltic countries. The conference starts on May 22nd at 13:00 and ends on May 24th at 13:30. Location: St. Bartholomeus Gasthuis, in the heart of Utrecht, the beating heart of the Netherlands, with its medieval city centre, world class festivals, modern achitecture, trendy shops and museums. The hotel is located in walking distance from the Central Station and about 40 minute from Amsterdam Airport Schiphol (AMS) by train. * A guided tour in the city. Important: Please note that accomodation is NOT included in the registration fee. All participants are advised to make their hotel reservations as soon as possible. Le CFATG organise un appel d’offre pour l’attribution de bourse(s) à un doctorant ou post-doctorant afin qu’il puisse présenter ses données au congrès «3rd Nordic Autophagy Society Conference». Cette bourse d’un montant de 600 € devrait permettre de couvrir l’inscription au congrès, le déplacement ainsi que l’hébergement. Critères d’éligibilité : Le candidat doit être membre du CFATG (cotisation 2019 à jour, pour devenir membre: http://cfatg.org/devenir-membre/) et ne doit pas avoir bénéficié d’une bourse du CFATG durant les années civiles 2018 (les « prix » donnés par le CFATG ne sont pas des bourses). The CFATG will offer grant(s) to PhD or PostDoc to assist and present theirs results to the «3rd Nordic Autophagy Society Conference» . The grant amount is 600 euros and should cover their expenses for the meeting. Eligibility: the candidate must be a member of CFATG (to subscribe to CFATG: click here) and should not be a recipient of a CFATG grant for year 2018 (awards are not considered as grant).